Let’s move Fashion Friday Up and call it a Cents of Style Fashion Tuesday – that way we can fill those stockings at an affordable price! Order by TODAY, 12/17/13 by 5 pm to ensure Christmas Delivery. Use coupon code STOCKING for FREE shipping and all items for only $4.95. Shoes, scarves, jewelry and more. Happy Holidays and Happy Fashion Tuesday! Another fun Frugal Fashion Friday, check out this outfit perfect for Fall and Winter. Add layers or leave simplistic. Accessories can dolls this outfit up or dress it down. Perfect for a Saturday afternoon shopping to dinner out with the girls. Mossimo Supply Co. Juniors Button Hem Sweater Dress (in Olive and Dog bone Stripes) $17.99 $29.99 Great sweater dress with nice reviews. Stay warm but still dress up. This dress appears to fall above the knee so keep your boots high or add some leggings for warmth. Sweater dresses can also be paired with a belt or used as a top. Frugal Tip: This item goes with FREE shipping when you spend $50. Also save another 5% with Target RedCard. Journee Collection Charming Tall Boots $39.99+ $89.99 With a decorative buckle and strap accents, these women’s Journee Collection Charming tall calf boots lend chic style to any casual outfit. Also check out these BOGO Boots – grab a pair for under $20! Pony Pashmina Scarf $12.03 with FREE shipping. This printed scarf is the perfect accessory to travel with. Its sheer, light material is breezy enough to wear on a warm day, while its oversized, rectangular shape is perfect for bundling up in on chilly evenings. The tan and black color scheme of this accent matches nearly everything. This is $19.99 on ModCloth. Envelope Clutch Purse Sale $6.99 with FREE shipping. Boutiques have these purses for about $30. I personally purchased one and love it. I am going to take it to my local monogram store and get it monogrammed. Shipping does take about 2 to 3 weeks. Brown would be the perfect color to match! Gold Plated Matte Multi-Colored Stone Triple Bangle Bracelet $71 $142 Love the details these little gems bring to the outfit. A neutral pallet, they add a touch of color making them stand out and pop. Reminder – follow Frugal Coupon Living on Instagram and Pinterest for other Frugal Fashion designs and finds! Like the Brown Sweater Dress Outfit? You can find more Frugal Fashion Deals on Frugal Coupon Living. As part of Frugal Fashion Friday, I wanted to remind you that Amazon is still having their 30% off jewelry sale. This sales give you the perfect chance to keep it new and fresh for less! Save 30% on qualifying items shipped from and sold by Amazon. Enter code 3OOFFDEC at checkout. Perhaps this could help wrap up your holiday shopping! Pair these jewelry deals with the $5 off $35 coupon coupon to save more! Reminder: Shipping on Amazon when you spend $35 or with Prime Shipping. Don’t forget to grab your $5 off $35 Amazon Savings. Learn how you can grab a FREE Trial to Amazon Prime– for FREE 2 Day Shipping for the this holiday season! Find more Amazon Deals and Holiday Deals on Frugal Coupon Living. Adorable trending Chevron scarf for this Fashion Friday at Cents of Style. Many of you have been loving the Chevron Scarf Deal on Frugal Coupon Living. Now you can also pick up a scarf for $7.95 on Cents of Styles Fashion Friday Sale! Head over to Cents of Style and grab any Chevron Scarf in 12 different colors. Don’t forget that Amazon has a Chevron Infinity Scarf for $8.99 Shipped. Want more from the Fahsion Friday Chevron Scarf Sale? How about ways to wear it? Also check out both of these Frugal Fashion Friday Outfits – The Jessica Simpson Sale and the Fashion Friday Grey Outfit (grab the look with a Chevron Scarf included!) The look would go VERY WELL with the STEVEN MADDEN purse sale (I have gotten so many complements on this item! Follow Frugal Coupon Living on Instagram for more Frugal Fashion Friday looks. Head to Cents of Style for a look. Apt. 9® Striped Pencil Skirt $16.20 $21.60 $36 – This women’s Apt. 9 skirt is a chic pick. Pencil styling is cut straight from hip to hem, giving you a feminine, flattering silhouette. Stretchy jersey construction that can be machine washed. Frugal Tip: Currently Kohls has 25% off with coupon code FF25DEC. Place the item in your cart and grab it for $16.20. This is over 50% off. Grab free shipping and $10 Kohls Cash Back when you spend $50. Zehui Chiffon Vest Blouse with Belt $13.39 $29.99 Keep the top simple. You want your golden hues to pop and you want the skirt to stand out. If you have a white blouse, tee, or top, perfect. If not consider this Frugal Find. You could grab the pink or yellow top too, just change the mustard accent on the scarf and shoes. Pair with a white or navy blazer. Frugal Tip: As always, get FREE shipping on Amazon when you spend $35 or with Prime Shipping. Learn how you can grab a FREE Trial to Amazon Prime– for FREE 2 Day Shipping for the this holiday season! Touch of Honey Flat $29.99 Topped in a gold-tipped bow, this vegan faux-leather ballet flat is bound to become your featured look! http://www.modcloth.com/shop/shoes-flats/touch-of-honey-flat These are selling out fast. If they do, also take a look at the Defined the Scenes Flat in Mustard $29.99, the Stylish Steps Wedge in Sunflower $69.99 or Baker’s Dozen Flat in Lemon for $32.99. Frugal Tip: Get free shipping when you spend $50. New customers save $10 off $75 by going through THIS LINK on your first order. Bow to Stern Scarf in Mustard Dots $7.99 You’ll be the ranking skipper of style when you’re seen waving from the deck in this darling scarf! When worn in a billowing bow around your neck, this polka-dotted, mustard look adds a nostalgic touch to any nautically inspired ensemble. Cinch this silky neck scarf over a pale blue blouse with high-waisted shorts, a bounty of wooden bangles, and cork-soled wedges for a look that will make that armada of admirers seem to lose their sea legs! Chain Reaction Bracelet $9.95 $14.95 – An easy and trend-right chain bracelet perfect for wearing over silk shirt cuffs or cashmere sweaters. High shine finish, toggle clasp. Dancing Leaves Earrings $18.99 As you’re driving to your evening soiree, you notice the leaves on the road twirling and swirling just like you’re about to! This pair of navy and gold earrings, and their one bejeweled leaf, add a hint of sparkle to your grey cocktail dress and tan pumps. Soon you’ll be dancing the night away! Update: now out of stock. Add to your wish list or tell ModCloth you “need it” Check out the Amazon Options too. Culture Purse Handbag $39.95 $49. The IT bag for fall. Rolled handles, hardware accents, and a large interior suit your busy lifestyle. The perfect addition to any wardrobe. This also would look great with a monogrammed cluth for $6.99 shipped! Reminder – follow Frugal Coupon Living on Instagram and Pinterest for other Frugal Fashion designs and finds! Like the Black Friday Outfit? You can find more Frugal Fashion Deals on Frugal Coupon Living. Pick up the PIKO shirt for $22.99 + $3.99 Shipping down from $42. Wear PIKO’s with skinnys and boots for a super chic look! These beauties are made of 95% bamboo and 5% spandex. If you have never worn an article of clothing made from bamboo…you’re in for a treat! Bamboo fabric is incredibly….and we mean INCREDIBLY soft! You seriously have to feel it to believe it! And the best part? These are sustainable! Look fabulous AND protect our environment? We don’t mind if we do! These tops are meant to be tighter on the arms and slouchy on the bodice. Small 0 to 4. Medium 6 to 8. Large 10 to 12. I have washed this shirt and it turned out just fine. Head to Groopdealz for yours! Love the PIKO Sale? Find more Holiday Deals on Frugal Coupon Living! This is my FAVORITE Fashion Sale to date! Home is where the heart is, no? TODAY on Cents of Style grab the State Necklace with Heart Design (all 50 states available) for $11.95 with FREE shipping. I AM QUITE CERTAIN these will sell out! 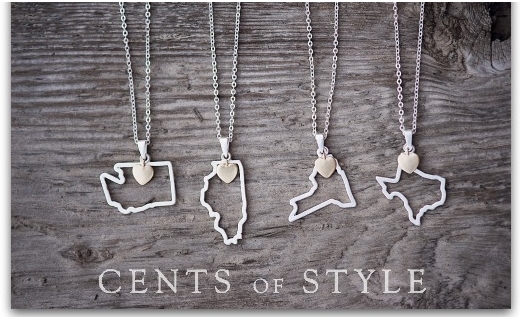 These Custom State Necklaces, exclusively to Cents of Style. I hope you are following me on Instagram – where a shared a preview last night! The necklace is a metal alloy in brushed silver. It has an 18″ chain with a 3″ extender. The pendant is the outline of each state and has a contrasting brushed gold heart charm, as well. Each necklace comes in its own custom designed Cents of Style envelope with string and button closure. A perfect gift for those close and far from home this Holiday season. These will all ship next week and arrive in time for Christmas! Grab yours for $11.95 & FREE SHIPPING with Coupon Code HOME at checkout. Love the Frugal Fashion Friday Heart State Necklace? Find more Fashion Deals on Frugal Coupon Living. Another fun Frugal Fashion Friday, check out this outfit perfect for our BLACK FRIDAY THEME! – Dress it up with leather leggings or dress it down with skinny jeans. LC Lauren Conrad Cropped Crepe Blazer $35.70 $42 from $70. Available in Black or White but of course Black is perfect for our Black Friday look. The awesome thing is a blazer and dress up a cotton skirt, be paired with the simplistic look of jeans or be used at work with dress pants – the possibility is endless and it looks sleek an sharp. The LC Blazer provides a lightweight crepe construction and cropped cut add modern style to any ensemble. SERIOUSLY A MUST for your wardrobe. Rock & Republic Pieced Faux-Leather Leggings $23.80 $28 from $48. Alright ladies, it’s time to “edge” up our wardrobe with some faux-leather pants. Why invest a ton of money for pants you are not sure how much effort you will put into. I often wear my black skinnies with a larger shirt. Something skinny and something larger allows you to balance your look and not feel too overdone. These women’s Rock & Republic leggings are made for the spotlight. Faux-leather front combines with a stretchy ponte back for a fashion-forward combination. Dont want the leather look? another option is the Simply Vera Vera Wang Solid Leggings . Frugal Tip: Buy both the pants and blazer. For Kohl’s Black Friday sale, use coupon code BLACKFRI for 15% off. This makes the pants $23.80 and the blazer $35.70. Pay $59.50, but for very $50 you spend, you get FREE shipping and also $15 back in Kohl’s Cash. That’s like $44.50 from a grand MSRP total of $118. White Chiffon Blouse $7.52 With the top, keep it simplistic. if you have a loose white tee, then add it. If you don’t, then this top is a cheap alternative. Shipping adds $1.69. The top comes is 14 other colors too! Azra Ankle Boots $19.97 – Well for the boots, would you expect anything else. You know how much I love JustFab, especially with their B1G1 Fall Boot sale! A basic bootie is all the rage for fall, and we can’t help but adore the subtle details of this beauty. Mixed material. Includes sleek side zipper and gold metal toe accents. e.l.f Nail Polish $.71 each – I shared with you this awesome e.l.f. Nail Polish Cube Set for the holiday. 14 nail polishes for only $10! Great deal and very orgininal and cute set – especially for the fashion forward gal who loves to make a statement with a pop of color on her nails. Update: Also check out this e.l.f. sale with $10 gift card and B1G1 50% off making these even less. Aviator Sunglasses $1.99 – These have 4 out of 5 stars and are cheap! Nice if you are trying out a trend that hasn’t left. If you are looking for the real thing, these are the places to go: No More Rack, Ideeli and Amazon. As I write this post, Ideeli (seriously one of my favorite discount name-brand sights) has a Ray-Ban Sale for as low as $89.99. I have seen them on No More Rack for as low as $79. For the cheap ones on Amazon, add $3.78 to your $1.99 cost for a total just over $5! Gold Double Tassel Long Necklace $15.99 from $69.99. Since the patterns on your jacket and top are basic, you can have a larger necklace that stands out. Placing a gold against your black or white pops. This necklace is heavily discounted and likely something you will wear with many outfits. Adjustable Stretch Design from 7″ to 12″ diameter. Shipping adds $8.28. Python Snake Black Oversized Clutch $20. This piece is versatile and can be used with your black dress or with your jeans and nice top $8.99 shipping when purchased from Unlimited Fashion. Geneva Black with Gold Chronograph Rubber Watch $6.08. Also another accessory that will get much use. I love that this watch is under $10 shipped! FREE shipping when you spend $35 or with Prime. Frugal Tip: Get FREE shipping on Amazon when you spend $35 or with Prime Shipping. Learn how you can grab a FREE Trial to Amazon Prime– for FREE 2 Day Shipping for the this holiday season!